Introducing your NEXT habit-forming solitaire app, FREE SPIDER SOLITAIRE. Do you have a solitaire obsession? Looking for a new solitaire variant to get you hooked and playing for hours? Why do we think you will be caught in our challenging web? - Play free spider solitaire online or offline - no Internet connection required! - High-quality graphics. Cards and game table are easy to read. - Simple rules - easy enough for kids. - Correct mistakes with the "undo" function. - Layouts adjust automatically to device - landscape or portrait mode. - Choose from a variety of cards and tabletop designs. - Drag & drop or tap-to-play. - Accommodates lots of different screen sizes. From Android phone to high-def tablets. No more fiddling with cards. Let us set-up the card table for you! - Spider Solitare is set-up with two decks - 104 cards total. The cards are laid out into 10 tableaus from left to right. The first four tableaus have six cards each. The remaining six tableaus have five cards each. - The top card of each tableau is turned face-up. The other cards will remain face-down. This leaves 50 cards leftover, which are placed in a pile. - Try to build a stack of cards, starting with King and ending with Ace, all of the same suit. - Build full runs of cards of the same suit, clear them from the table - and MASTER THE SPIDER'S WEB. 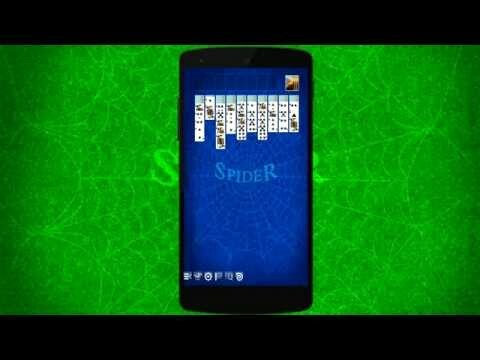 HOW IS THIS SPIDER SOLITAIRE APP UNIQUE? - We all make mistakes. That's why we've designed the UNDO feature. - Left-handers won't feel "left out." Our Spider Solitare App is designed to accommodate and will deal from either the left or right side. SHHHHH... SECRET SOLITAIRE TIPS AND TRICKS! - Before drawing a new card from the stockpile, be absolutely certain you are unable to play a card on the tableau. - Thinking of moving that card? A good rule of thumb is to try and only move cards if they will reveal a face-down card. - Always try to expose the cards you cannot see in the tableau - the more cards you see means a wider net of options. - If you have a choice between two possible down cards to reveal, choose the one that is in the biggest pile. Do you have Spider Solitaire strategies to share? Check out our site and let us know. Or simply pay us a visit to find out our other free card games, including KLONDIKE, PATIENCE, and many more! Increases card size on some lower resolution devices. Fixed bug that caused issues on some devices. Fixed bug that caused crashes on some devices. Fixed bug that causes crashes on some devices. Fixed bug to reduce slow rendering instances.